A student practices a piece for Northwestern’s upcoming “Danceworks.” The show will feature choreography by Garth Fagan, who choreographed “The Lion King” on Broadway. For Communication freshman Chloe Nadon-Enriquez, performing work by Garth Fagan — who choreographed Broadway’s 1998 production of “The Lion King” — makes her nervous. Twelve Northwestern dancers will perform the first piece Garth Fagan choreographed after he finished choreographing “The Lion King,” in “Danceworks 2016,” the Dance Program’s annual performance. The show opens this weekend and will feature works by five choreographers. 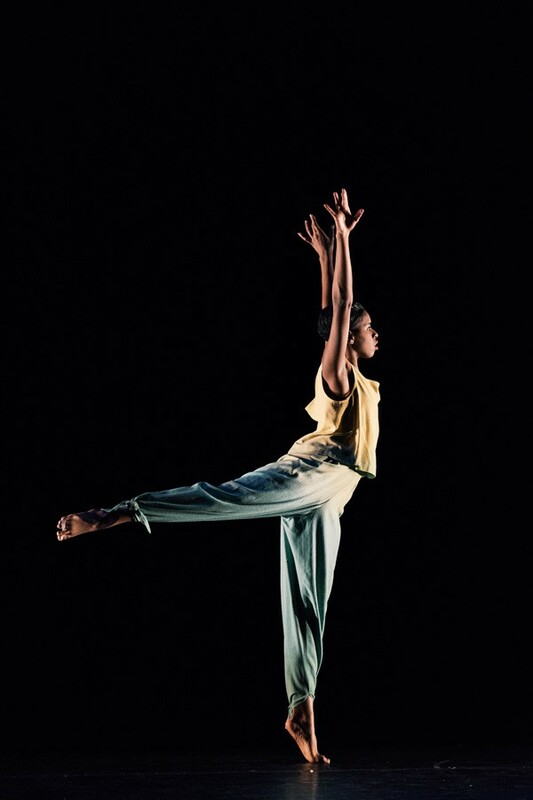 Fagan originally choreographed “Two Pieces of One: Green,” the piece that will be featured, in 1998 for Garth Fagan Dance, a dance company that he founded. “His goal for the piece was to be very different than “The Lion King” because he was trying to create a piece of abstract art on the plain stage, where the music didn’t necessarily match the choreography so the rhythm is in the dancer’s music,” Nadon-Enriquez said. Fagan said the music for his piece is a juxtaposition of 20th century and 16th century music. He added that these are two very different types that incorporate jazz rhythms and classical rhythms. Fagan saw students perform his piece for the first time on Friday night at a talk that he gave to the public. He said he enjoyed seeing the students perform because he often works with professional dance companies and appreciates the new style that students put on the piece. Nadon-Enriquez said his style is very different from anything she had been exposed to, as she trained in only classical ballet for 10 years. She was unsure of it at first because of the different style, but soon learned to appreciate it. Fagan describes his style of dance as “a jazz man’s approach to choreography.” He said he uses improvisation, leaps and turns to surprise the audience so they never know for sure what movement is coming. In his general choreography, Fagan puts a South African spin on well-known dance styles, such as ballet and modern, said artistic director and Communication lecturer Joel Valentin-Martinez. This polyrhythmic style of dance, with two or more rhythms not necessarily on the same meter, contradicts traditional rhythms, he said. Valentin-Martinez, who selected Fagan as a choreographer for “Danceworks 2016,” was originally introduced to Fagan’s work when he was 16. He said Fagan’s choreography changed his perception of what dance could be. When he was 19, Valentin-Martinez was offered a scholarship to train with Fagan in a two-week workshop. Fagan surprised Valentin-Martinez at the workshop and asked him to join his company. Valentin-Martinez then trained and toured with Fagan, and got exposure to other artists. “Touring, performing and engaging with Garth and his artistry really has informed me about the field of dance, who we are as humans, who we are as artists, and has had a huge impact on the way I form ideas about dance,” Valentin-Martinez said. Years later, Valentin-Martinez is coming back to his dance roots and described “Danceworks 2016” as a “thank you” to his former mentor. Valentin-Martinez also selected contemporary choreographer Rosy Simas, Hedwig Dances artistic associate Maray Gutierrez and Communication lecturer Jeff Hancock to each choreograph a piece for “Danceworks 2016.” Valentin-Martinez choreographed a piece as well. Simas choreographed a piece that deals with skin and perception and how people internalize judgment and perception, she said. This is her first time participating in Danceworks, and like Fagan, her work involves improvisation. The piece Valentin-Martinez choreographed is reflective of his California background and how the ocean affected his views on movement and dance. He said he is thankful for all of the work the choreographers and dancers have put into the show and feels especially privileged to share the work with Fagan.